<!-~~~~~~~~~~~~~~~~~~~~~~~~~~~~~~~~~~~~~~~~~~~~~~~~ Aether-Physics.com by: Norm Silliman File created 11/10/11 Last Edited 11/10/11 ~~~~~~~~~~~~~~~~~~~~~~~~~~~~~~~~~~~~~~~~~~~~~~~~~-> Newton 3rd law Revisited"
Newton's 3rd Law? Newton's 3rd Law? Newton's 3rd Law? Newton's 3rd Law? Newton's Third Law of Motion (from Principa Vol.I, 1686) is "To every action there is always opposed an equal reaction: or, the mutual actions of two bodies upon each other are always equal, and directed to contrary parts." No reference to "Force". In Definition IV Newton states "an impressed force is an action exerted upon a body, in order to change its state, either of rest, or of uniform motion in a right line. This force consists in the action only, and remains no longer in the body when the action is over. For a body maintains every new state it acquires, by its inertia only. But impressed forces are of different origins, as from percussion, from pressure, from centripetal force." I see Newton uses "action" interchangeably with "force", since an action without a body is meaningless. Apparently Newton did NOT know about gyroscopes,or incline planes. First, William Alek provides us with his 2008 replication of Naudin's 1998 results, with this video of how gyroscopes handle "forces". If you rotate the frame, pushing the gyro arm away from you, the arm moves up, and reciprocally, if you rotate the frame towards you the arm moves down. Second, in this motorized video, the reverse is shown. If you move the ARM (via a motor) the frame rotates toward you, the exact reciprocal of the Naudin and Alek videos. There appears to be symmetry between away and towards while maintaining symmetry between up and down. Since our mind-set follows from Newton's statement that [assumed]linear forces/actions ACT linearly (which is true), the implied assumption is that ALL forces MUST act linearly. Now that we know that Newton's 3rd law is NOT always true, as shown in the videos, and that we now have another force that does not act linearly. While Newton says "an impressed force is an action exerted upon a body", he did not (and no one since) make any attempt to define HOW this action works. Describing force as a verb apparently was enough back in the 16th century. 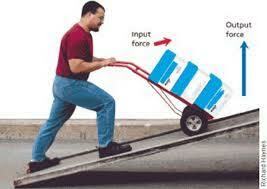 Describing force as a Noun was appearantely beyond them (and is beyond the Scientists of the 21st Century). We now have the opportunity of explaining the cause of this NEW force, and by extension, all forces. The Question of "how" does a force "work" is important and we now have another major clue to help figure it out. We have a clue with this experiment. Something (an impressed force) goes into the wheel and it (an impressed force) is spit out at 90 degrees. It appears that when the force goes in the side of the gyroscope, the force comes out the bottom at a 90 degree angle, since the effect of the counter-clock wise push results in an upward (counter-clock) motion of the gyroscope. 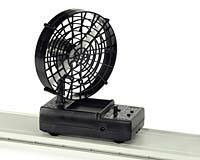 This Fan Cart from pasco.com provides us with a physical example of force going in (turning the fan blade) and force coming out (flow of AIR) at 90 degrees. The correlation of a (mechanical) force applied to a rotating device with the result of an Action-at-a-distance flow of a fluid (air) at a 90 degree angle is exactly like the Gyroscopes action. 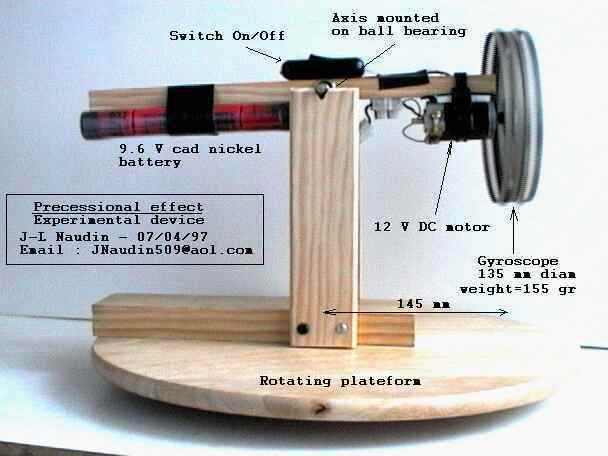 We have an electric motor powering the turning of the rotator, which would have a reverse turning action on the motor if the motor was NOT fixed to a stable "frame" which absorbs this force/action. There is one important difference that is of interest, and help us understand how this process works. Once the working flow is generated, in both cases, the force of the out-bound flow of particles is off-set by the force applied to the frame of the generator of the flow, just as the 3rd law describes. The subtle difference is in the magnitude of the flow particles. The gross mechanical difference is in HOW the particles are manipulated to flow. Fans, propellers, and screws all have one thing in common: they are variations of an incline plane, operating in a circle. This image show the relationship to two force vectors, one horizontal, labeled input force and one vertical, labeled output force in relationship to the wedge shape. Fans and propellers apply force to move the incline plane, rather than the mass sitting on the wedge, which is the inverse of applying the force to the mass directly. The fan in the cart (above) is an incline plane turned on its edge, operating in a circle, with the input force vector in the vertical plane, and the output force vector in the horizontal plane. Looks like any device that is based on the incline plane, violates Newton's 3rd law of motion. Incline planes translates a force vector from one (mathematical) dimension to another (mathematical) dimension 90 degree apart, just like the gyroscope. This analogy says that the gyroscope operates like a mechanical fan, and allows us to manipulate the Aether directly. The incline plane works as if the force vector is reflected from the surface of the boundary layer of the top of the wedge. How do we get a boundary layer at the sub-atomic scale? When the grinding wheel is pushed into a softer material, the rotating wheel throws the softer material particles off at a 90 degree angle. The Gryoscope only generates this output force vector when the input force vector is pushing the gyroscope sideways in the plane of the disk, perpendicular to the axle. 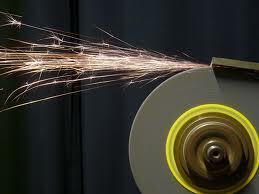 The grinding wheel looks like a likely model for what might be happening at the sub-atomic scale. The incline plane needs a boundary layer to work it's magic, but there are no known boundary layers at the sub-atomic scale. Other rapidly rotating mechanical objects create shear zones (laminate wet layers) in the fluids they are emerged in where the fluid near the rotating object is "dragged" with rotator, while the fluids farther away are unaffected. When the gyro wheel is pushed into the the ambient Aether field at the side, the wheel throws the Aether particles off at the same 90 degree angle as the grinding wheel. This gyroscopic force fits right in with the other Action-at-distance forces (a flow of a fluid being the agent of the force). The pattern stays consistent, and the support for the "Flow of Aether" as the agent gets stronger. Up until now, we have had to rely on sub-atomic particles to do that work (generate light, generate magnetic fields) for us.